A few years ago (maybe like 30 years ago), I discovered the sport of curling as we had a fun spiel organized at work. I was new in town, and had never played. 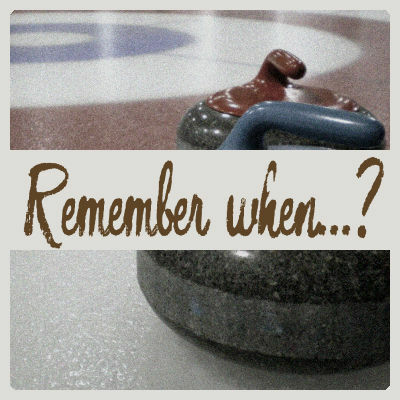 However, I do remember that, when I was quite young, I would watch curling, on TV. I must have been 6 or 7 years old, living in Montreal. It is a big city, and the popular sport was hockey. My Dad used to watch hockey on tv, but he was not big on practicing sport himself. One day, as I was watching tv, on my own, I stumbled upon some curling. I watched, puzzled. What is that? Looking at those grown men sweeping the ice in front of that moving object, I remember wondering why in the world they were sweeping using those funny looking corn broom. Shouldn't the area be clean enough by then? As I kept watching, I could see those objects being thrown (and swept) and something else was puzzling me: why were they not trying to remove the other color rocks when they were throwing theirs? Shouldn't that be the aim of the game? I thought it was strange that they would leave them there. But even worse was the way they would count. I was already in school, and I knew how to count, but whatever color I would count, the scoreboard never matched what I saw. There might have been 3 blue rocks and 4 red rocks, yet, the scoreboard would show "2". Can't they count? When I was properly introduced to curling, to how it is done, why the players kept sweeping over and over and how the score was calculated, it all made sense, but that was over 15 years after I was completely puzzled by that "odd sport". Have you ever seen something, as a child, that just didn't make sense in your mind while it did, for any other adult around? What was it? Share that story in the comments below.